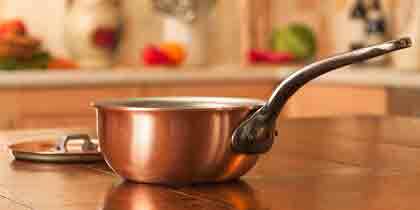 The genius of this 18cm solid copper saucier is in the gently curved profile which completely eliminates sharp angles where essential ingredients might stick. Patented Falk bimetal construction combines the superior even heat distribution of copper with the non–reactive properties of stainless for pure food flavour every time you cook. For sauces, reductions, roux and other delicate recipes that require careful regulation of temperature and frequent stirring. Satinated surfaces make fussy polishing a thing of the past. Ergonomic cast iron handles for a comfortable cooking experience. Falk Culinair. Our clever design outshines, outlasts and outperforms every expectation.